As the events of the last race of the season unfolded at Interlagos, twitter became awash with criticism of the stewards decision to levy Felipe Massa with a drive through penalty. 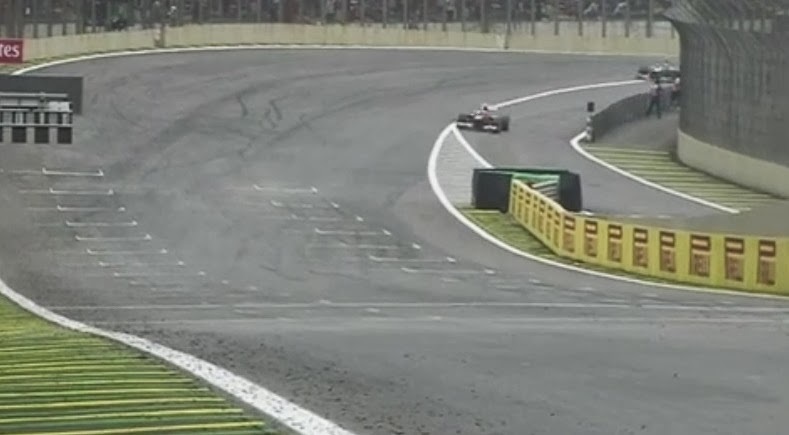 The Brazilian was himself none too impressed, gesticulating as he passed through the pitlane to serve his penalty after he'd already told Rob Smedley (his race engineer) "This is unacceptable, this is unbelievable, unbelievable, unacceptable" in an exaggerated tone. Not shown in the picture above but a separation in the line before the juncture with the hash markings was also made on the track to define this limitation. As we will see in the next few images all the drivers skirts the pit entry line at Interlago's as it opens up the corner and allows a quicker exit. Massa however stepped over that line much further than any other driver I can find footage of. Above: Onboard with Felipe on lap 22 just like Hamilton above we can see the Brazilian skirting the line as if it were the apex, however pay attention to the proximity of the car to his left. This is the primary reason that the warning was issued prior to the GP as the closing speed from full race pace (Massa) to the car entering the pitlane is pretty drastic. 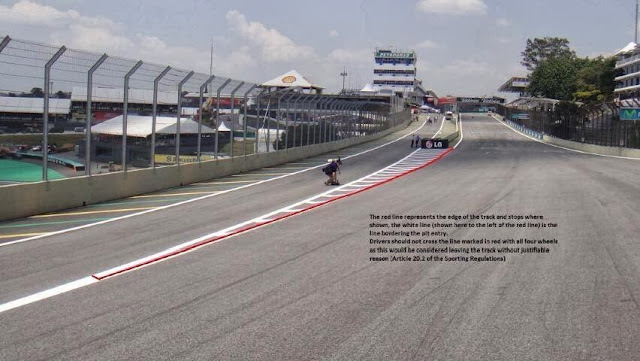 Above: Many complained on twitter to me that Vettel too had been cutting the pitlane line limit and as we can see he did indeed skirt it here but we don't find all 4 wheels over the hash markings. 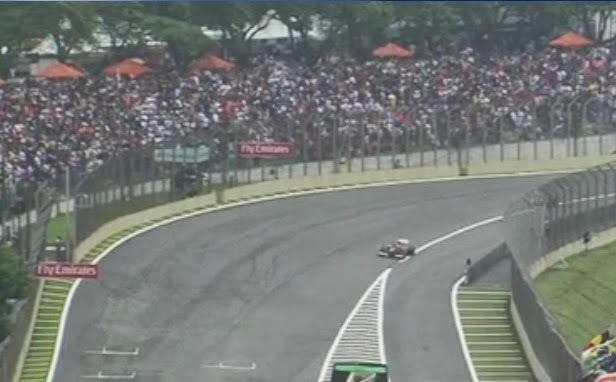 Above: Lap 30 and as we can see following a warning from Rob Smedley the Brazilian has re adjusted his line through the turn. As far as I'm concerned it's a stonewall penalty, did others do the same? That I cannot tell you, but from the footage I have they didn't. 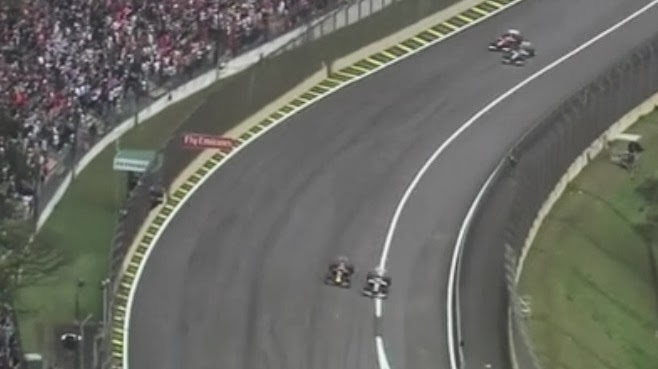 First of all Chilton and Gutierrez did the same in practice. Why did they got away was a reprimand and weren't given immediatly a grid penalty? The secound thing is that Massa got no warning at all before the penalty was applied. The viewers and teams were informed that an inverstigation is happening, Smedly then told Massa to watch his line, and a few laps later the penalty was applied. Now the normal procedure (normal is a quite ironical term when talking about FIA decisions) as we saw with Chilton and Gutierrez and as we saw with some examples from the past is, that if a driver systematically cuts a corner or leaves the track to gain an advantage, he will get a warning to stop exactly that (or let a driver past in case he overtook someone). 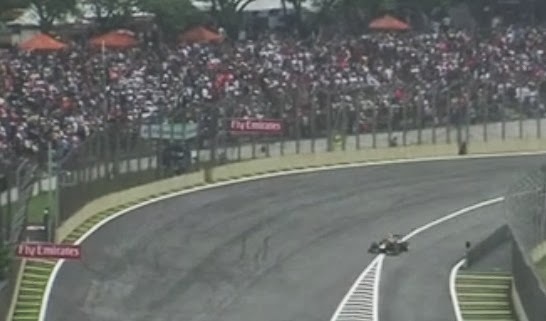 If he does not accept that or starts to alter his racing line a penalty was applied. Now considering the fact that Massa neither gained a noteworthy advantage with that, nor did he put anyone in danger, a warning before applying the penalty would have been fair. The randomness of the FIA with applying that rule or more precisely with penalising it it unacceptable. But Officer - you can see all those other drivers breaking the speed limit - why pick on me!! Massa seemed to get a warning via Rob Smedley, but continued to cross the hatched area. Lots of transgressions by other drivers it would appear, but if you get caught, expect to pay. In times where the FIA has a thousand of diffrent cameras and can look at telemetry this can't be an argument. And as you can see in the pictures he has altered his line after the warning from Smedly. As I said, it's the ones that get caught that get penalised, just like on the roads. The FIA miss quite a few technical transgressions (or cheating) too, but only the ones that get caught have to pay!